Stromboli - part pizza, part calzone, all party! Posted on Sun, Jan 22, 2012 : 7:17 a.m.
To serve, stromboli are simply sliced like a loaf of bread, creating a spiral baked sandwich that is perfect for large parties. A stromboli is kind of a cross between a grinder and a calzone. Bread dough is rolled out, filled with sliced meats, cheeses and vegetables, then rolled up into a tube and baked. 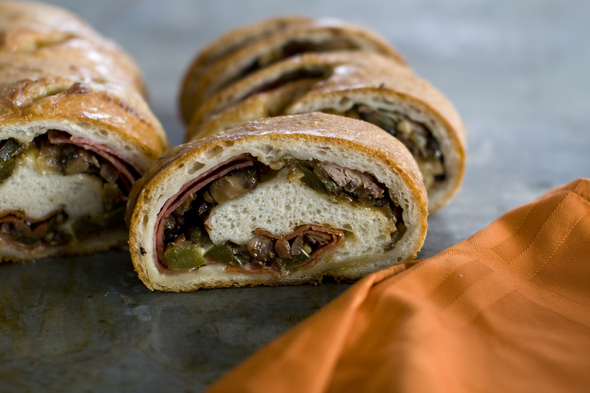 To serve, stromboli are simply sliced like a loaf of bread, creating a spiral baked sandwich that is perfect for large parties. If you like, you also can serve sandwich condiments (or even warmed marinara) alongside the stromboli slices for dipping. We've offered suggestions for fillings; but mix and match to suit your group (or devise your own combination). Just be careful with vegetables. Because you will be baking the fillings in the dough, watery vegetables (such as tomatoes) can release too much liquid during cooking. To avoid this, cook most vegetables in a skillet before adding them. Sun-dried tomatoes would be a good alternative to fresh. In a large skillet over medium-high, heat the oil. Add the vegetables and garlic, then saute until tender and any liquid has evaporated, 5 to 10 minutes depending on your choice of vegetables. Stir in the olives, capers and herb blend. Season with salt and pepper, then set aside to cool slightly. On a lightly floured surface, roll out the dough to a 12-by-16-inch rectangle. Arrange the sliced meat over the dough, leaving a 1-inch border on the longer sides, as well as the end furthest from you. Spread the cooked vegetables over the meat, then sprinkle with the cheese. Starting with the side closest to you, roll the stromboli up like a log. Pinch the seam and ends to seal. Transfer the log to the prepared baking sheet with the seam on the bottom. Using a paring knife, make three deep slits in the top of the loaf. Heat the oven to 375 F. Allow the stromboli to rest for 20 minutes while the oven heats. Bake for 40 to 50 minutes, or until a meat thermometer inserted at the center reads 180 F. The outside should be golden brown and should sound hollow when tapped. Allow to cool for at least 20 minutes before slicing. Nutrition information per serving (values are rounded to the nearest whole number): 430 calories; 240 calories from fat (55 percent of total calories); 27 g fat (9 g saturated; 0 g trans fats); 60 mg cholesterol; 28 g carbohydrate; 22 g protein; 1 g fiber; 1,740 mg sodium.